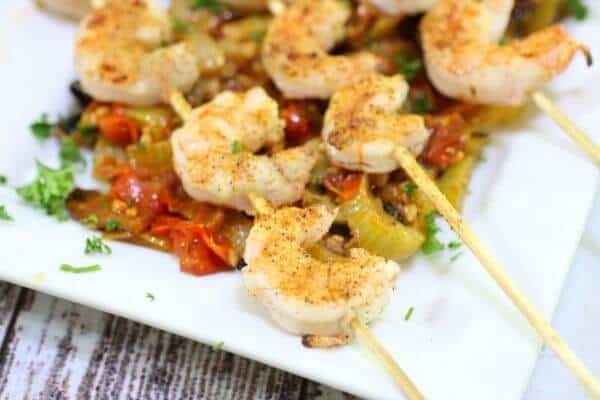 Tender, succulent grilled shrimp are served on a bed of roasted tomatoes and peppers for the most amazing Shrimp Creole you ever put in your mouth. 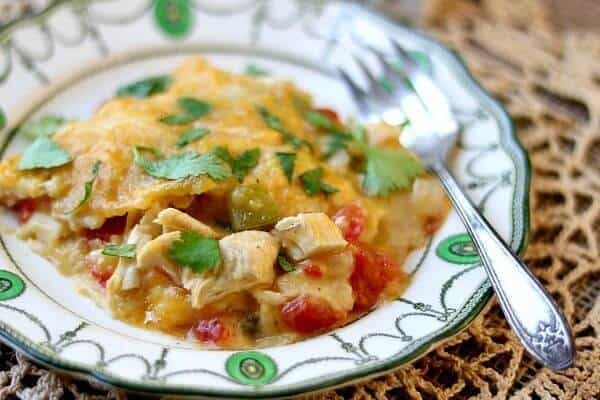 It’s a deceptively quick meal – 30 minutes or less for the whole thing. It’s a great recipe for summer parties! A few weeks ago I was paging through a copy of a Southern cookbook from the early 1900s. 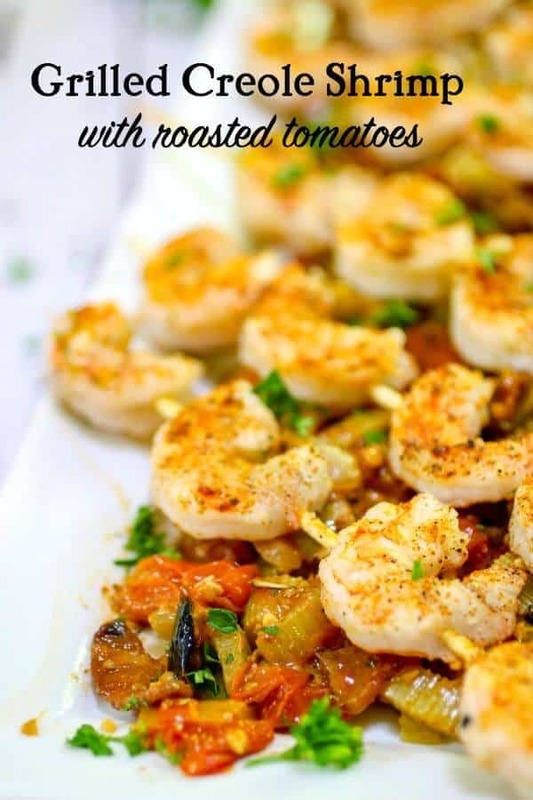 In it was a recipe for Creole Shrimp that was pretty similar to how it’s made nowadays. I was looking at the ingredients and I wondered how in the world I could make an updated version of this iconic dish that would honor the tradition while kicking it up a little. I had a lot to live up to. My best friend, Edye, is from Louisiana. We already argue about the proper way to say praline – I didn’t want to make a traditional creole dish and have her tell me I had completely jacked it up. I decided to grill the shrimp and roast the vegetables for the Creole sauce rather than simmering or sauteeing. OMG it was amazing. Really amazing. So much flavor! You’re going to love it as much as she did! It’s actually one of the best ways to cook them as far as I’m concerned! So easy! How do you make shrimp on the grill? Brush shrimp with oil or butter. Season with salt, pepper, or whatever seasonings you’re using. Place on a preheated grill until done. How long do you cook jumbo shrimp on the grill? You want shrimp to be just cooked – they get rubbery if they are cooked too long. Plan on about 3 to 5 minutes total, turning once – depending on the size. Can you grill peeled shrimp? Yep! Peeled, deveined shrimp are the easiest to work with. 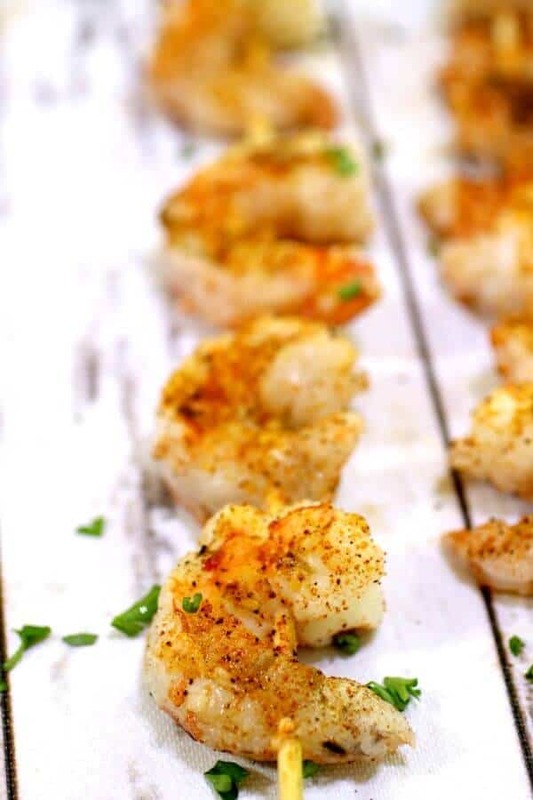 Just grill as above – in fact I used peeled, deveined shrimp in this recipe. 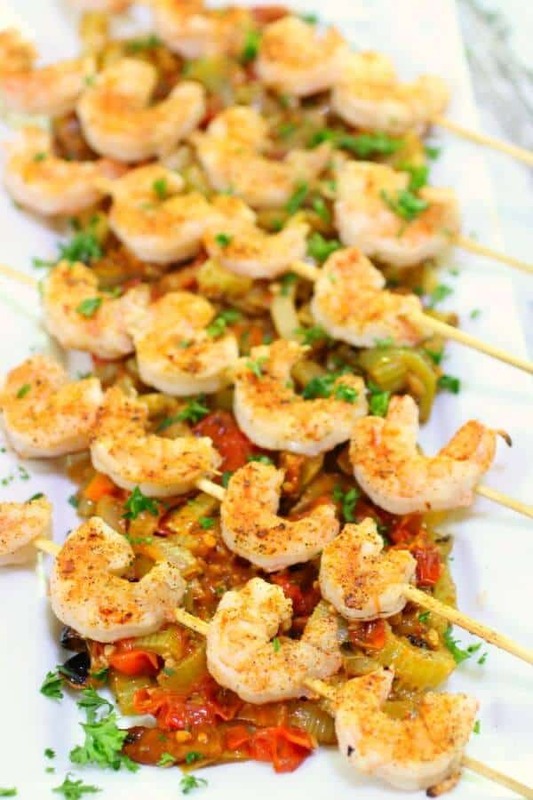 How do you grill shrimp on skewers? Soak the skewers in water, cayenne, and lime juice for about 30 minutes. The flavor will infuse into the shrimp as they cook. Don’t crowd the shrimp, make sure there is space between them. The magic in my updated version of Shrimp Creole is in roasting the vegetables for the sauce rather than boiling them together. Roasting brings out sweetness and flavor like nothing else. Be sure that your oven is completely preheated before putting the pan of vegetables in it. Place the vegetables that you’ve prepared for roasting in a large bowl. Add olive oil and seasoning. Toss until the vegetables are coated with oil. Place the vegetables on a heavy baking sheet with plenty of space between them. 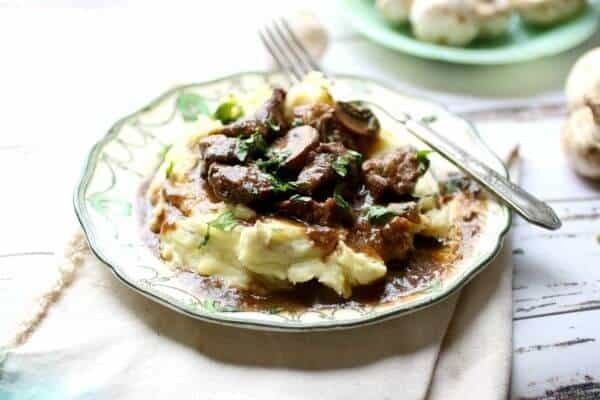 Roast for 10 to 20 minutes, or until charred areas appear on the vegetables and they are tender. If there’s any particular secret ingredient in this recipe it’s the Tony Chachere’s Creole Seasoning. 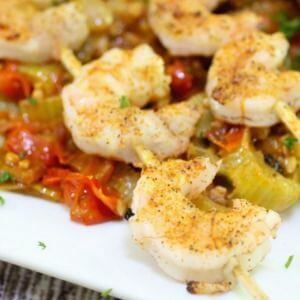 Spicy and flavorful – it’s used to season the shrimp and the sauce. I really do use this stuff a lot. I know that you probably HATE buying an ingredient you’re never going to use again, right? Here are some more recipes that use this product. This shrimp Creole is as fresh and summery as it can be. My friend told me that she took some to work the day after we had it and it was just as good warmed up. I don’t know about that – I’d suggest eating it all the day you make it. Believe me, that won’t be difficult. 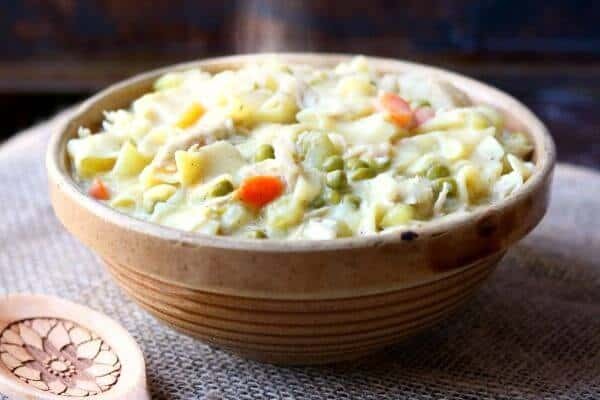 If you love this recipe please give it 5 stars. Included in Meal Plan Monday– Check it out! You’re breaking my heart!! NOT like seafood?! That’s an outright sin!! 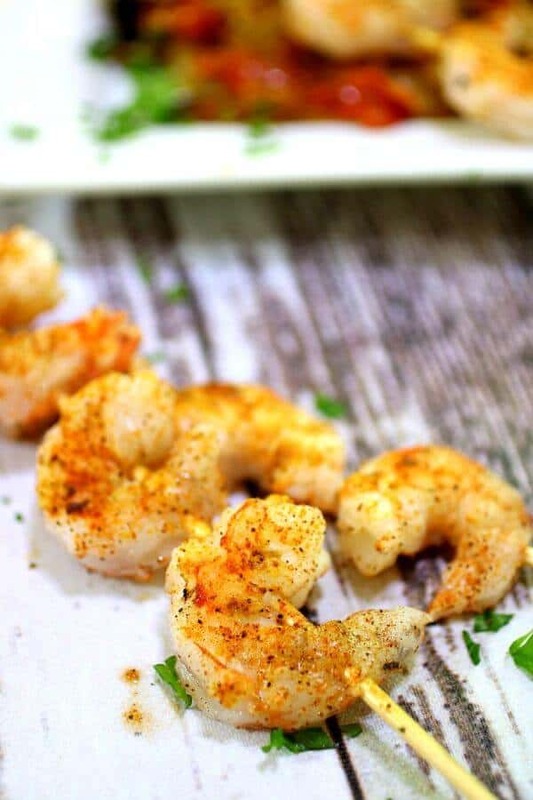 We love our seafood and I must have at least hundred shrimp recipes. I got to make it 101 with this one. Can’t wait!! Sorry. 🙁 Im from Central Texas. Not big fish country.